Ninety-nine business leaders made the Loudoun Chamber of Commerce After Hours Mixer at Catoctin Creek Distillery on July 17 the best attended one of the year. The Speakeasy-themed event and new member reception was a mix of Chamber members, Purcellville Business Association members, and those interested in seeing what the Chamber has to offer. Host and sponsor Catoctin Creek, also a Chamber member, provided light snacks catered by Magnolia’s and their ever-popular cocktail, whisky, and brandy offerings. Catoctin Creek was the Chamber’s 2012 Small Business of the Year recipient. For more information on the Chamber, go to loudounchamber.org/Home. To learn more about the Purcellville Business Association, go to purcellvillebusiness.com. Source: Stearns, Judy. 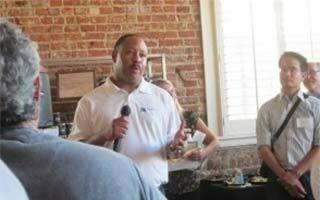 "Chamber Mixer in Purcellville Draws Year’s Biggest Crowd." Purcellville Gazette, July 25.